I'd started plotting a new American Colonial-era romance. I'd visited Williamsburg, VA and spent two unbelievable days there, with people who were so knowledgeable that no matter where they worked and what questions I asked, they knew the answer. I can't tell you how much fun I had. It was just great. So when this topic came up, I though "Oh, I'll do something on the Revolutionary War battles." People in the know about American history can probably name several Civil War Battles--Gettysburg, Shiloh, Bull Run, and Sherman's march through Georgia, which wasn't technically a battle. But the Revolution? Interest in it kind of dies off after Washington's crossing of the Delaware and the winter of 1777-1778 spent in Valley Forge, PA. The beginning of that war is ever so exciting: you've got Lexington & Concord and the shot heard round the world. You've got the siege of New York, the barricade of Boston, the threat to the then-capital, Philadelphia. Treason, sedition, Tories and Patriots, and all sorts of political maneuverings. After all that? It's just a war. Eh, we won. I challenge you to name five commanders who were not Washington or Benedict Arnold. Go ahead...I'll wait. And no cheating with the internet! There were tons of battles. I mean tons! And they were everywhere. From Quebec to Ogeechee River, Georgia. My Revolutionary War has everything you'd ever want to know about these battles and more. Much more...my eyes crossed. But let's talk Valley Forge, Pennsylvania. Granted, you probably have heard of it, especially if you live within driving distance of the National Park. It's not the most esoteric of places, and is one of the more widely known locales of the Revolution. But does anyone really care about The Battle of Ogeechee River, Georgia on July 12, 1781? Let's see. On July 12, during the night, Capt. Anthony and 20 men from his privateer proceeded up the Ogeechee River. They wanted to capture a schooner loaded with rice. Anthony captured the ship, but before he get it out to sea, a British galley, commanded by Capt. ?? Scallan, intercepted him. Anthony's force escaped to the shore. Valley Forge National Historical Park commemorates more than the sacrifices and perseverance of the Revolutionary War generation; it honors the ability of citizens and their leaders to pull together and overcome adversity during extraordinary times. 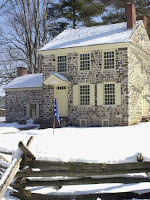 So after all this research, my blog entry morphed into: What you might not know about Valley Forge. Back then, war was not fought in the winter, hence the term Winter Quarters. So Washington, searching for winter quarters for his men, and having just fought the Battle of White Marsh (now Fort Washington State Park), decided on Valley Forge, Pennsylvania. Named for an iron forge on Valley Creek, the area was ideal: Close enough to the General Sir William Howe and his redcoats to keep them out of the Pennsylvanian interior and, more importantly, only 18 miles from the Philadelphia capitol, and far enough away so the British could not spring any surprise attacks. The high ground of Mount Joy and the adjoining elevated ground of Mount Misery combined with the Schuylkill River (pronounced SKOO-kull), to the north, made the encampment defensible. On December 19, 1777 the army limped into Valley Forge. They were cold, tired, hungry, poorly equipped, and poorly trained. It was frigid out, and the 12,000 soldiers of the Continental Army pretty much collapsed. But they'd collapsed on cold ground, so they built cabins and huts, and began foraging. But this was winter during the Little Ice Age when the Delaware River actually froze--that painting of Washington Crossing the Delaware wasn't imagined. This was one of those winters on the east coast where it's freakin' cold! It snowed--then melted...and snowed again. They weren't dry. They were sick and disease festered. So what made it the turning point of the Revolution? Time. They had nothing else to do but complain and train. While not the deserter army many picture, they weren't the British either...no one was. But Americans had something the British Army did not: determination. And they had Baron Freiherr Friedrich Wilhelm von Steuben>. Formerly on Frederick the Great of Prussia's elite General Staff, and now unemployed, Friedrich was hired by the American Army to train the troops. He worked directly with the men, drilling them every day all day. Before that winter was over, American soldiers moved smartly from line to column, column to line. They loaded muskets with precision and drove imaginary redcoats from the field by skillful charges with the bayonet. When the Army paraded on May 6, 1778, to celebrate the French alliance with America, Friedrich received the honor of organizing the day's activities. Still at the site today is Washington's military headquarters, recently restored. 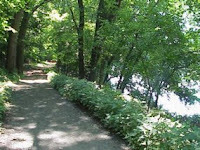 Also on the south side of the Schuylkill River are the Grand Parade, the Welcome Center, and the paved Joseph Plumb Martin Trail. They have original cannon lining the park, and you can take pictures on it. Or you could last time I was there which was...ah, a very long time ago. Other than the history, there's the nature aspect of it. The 3,500 acre park boasts a river, numerous streams and forested wetlands, eastern deciduous forest, and tall-grass meadows. In addition to wetlands and archaeological sites, you can bike, hike, or picnic along permitted paths. It's a wonderful way to spend the day, or better, a long weekend so you can really see everything. There's also a restoration project going on, whose goal is to improve trout habitat and angler access. So maybe you've heard of Valley Forge after all, but now you know more about it!